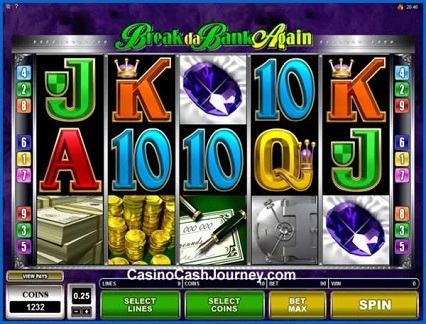 Game Information: Break da Bank Again is the long-awaited 2008 sequel to Microgaming’s cult-classic Break da Bank. The original game is still a huge hit with New Zealand pokies fans and is still one of the most played of all Microgaming slots. Microgaming have kept the core theme true to the original but have vastly improved upon the original graphics and gameplay and offer players the same opportunities to walk away with massive payday opportunities. As you may have guessed by now, break da Bank Again is a high volatility game. Break da Bank Again takes off where its predecessor left us and promises plenty of action with tons of great game features and bonus rounds. Wild Symbol: The game’s wild symbol is represented by the Break da Bank logo and it replaces any other game symbol with the exception of the scatter symbol to create easy winning combinations. The wild symbol also has the added advantage of acting as a 5x multiplier in the base game and a 25x multiplier in the bonus round. Scatter Symbol: The scatter symbol is represented by the Vault Door and getting three or more of these across the 5 reels will automatically trigger a free spins round. Three scatters gets you 15 free spins, while four will get you 20 and five, 25 free spins. Getting more vault door symbols during the free sins round will retrigger the free spins round. While the game offers quality graphics and a cool overall style, some may find the clear lack on any sort of animation (other than the vault door that opens) a bit boring. Otherwise the overall style of the game is quite colourful and will certainly please most preferences. Microgaming have decided to go with a bit of class here, perhaps in line with a sort of nod to the mobster/bank robber heyday. The music is classic jazz which is combined with equally classic Las Vegas casino sounds and bells whenever you hit a winning combination. While Break da Bank again does not offer a progressive jackpot pokie like some of Microgaming’s other high profile titles, the designers have still imbued it with plenty of massive payday opportunities anyway. Lucky players can win as much as 98,750 coins which amounts to close to $25,000 if played on max bet ($22.50) with just a single spin! The house edge in Break da Bank Again is around 5% with a high volatility and plenty of winning opportunities thanks to great scatter and wild symbols. 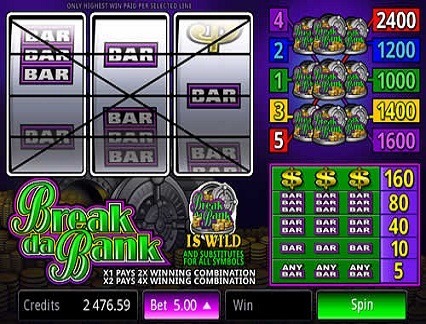 Break da Bank Again does not come with all the bells and whistles like some of Microgaming’s other titles but it does offer awesome special game symbols as well as a bonus round that can add to your total very quickly. The special games symbols, namely the wild and scatter symbol are slightly transformed during the bonus round and offer more than they do in the base game. The wild symbol in the base game offers a 5x multiplier which shoots up to a massive 25x multiplier during the bonus round! Similarly, you only need to get a single scatter anywhere during the bonus round to retrigger free spins, resulting in a potentially massive pay out for this game!